WASHINGTON — The day after he fired James Comey as director of the FBI, a furious President Donald Trump called the bureau's acting director, Andrew McCabe, demanding to know why Comey had been allowed to fly on an FBI plane from Los Angeles back to Washington after he was dismissed, according to multiple people familiar with the phone call. McCabe told the president he hadn’t been asked to authorize Comey’s flight, but if anyone had asked, he would have approved it, three people familiar with the call recounted to NBC News. The president was silent for a moment and then turned on McCabe, suggesting he ask his wife how it feels to be a loser — an apparent reference to a failed campaign for state office in Virginia that McCabe’s wife made in 2015. McCabe replied, “OK, sir.” Trump then hung up the phone. A White House official, who would not speak on the record, disputed the account, saying, "this simply never happened. Any suggestion otherwise is pure fiction.” The FBI declined to comment on the call. Trump, enraged by TV footage of Comey boarding the government-funded plane hours after his firing, believed that Comey should not have been allowed to take the plane, that any privileges he had received as FBI director should have ceased the moment he was fired, the people familiar with the matter said. The previously unreported exchange between Trump and McCabe was one of a series of attacks the president aimed at McCabe that fueled tensions between the White House and the Justice Department and culminated Monday with McCabe stepping down as the FBI’s deputy director. In the past, Trump had also reportedly asked McCabe how he voted in the 2016 election and repeatedly made public references to campaign donations his wife had received from an ally of Hillary and Bill Clinton. White House Press Secretary Sarah Huckabee Sanders said Monday that the White House was not part of McCabe's decision-making process about stepping down. In recent weeks the White House has agitated for McCabe’s exit, saying he is part of a broader pattern of bias against the president in the highest levels of federal law enforcement. Defenders of the Justice Department’s leadership say the charges of bias are part of the president’s effort to try to undermine the federal probe into Russia’s meddling in the 2016 election and possible collusion between the Trump campaign and Moscow. Trump’s repeated criticism of McCabe, both in public and private, made the FBI’s deputy director the leading example of concerns Republicans have increasingly raised about potential impartiality at the Justice Department. The phone call between Trump and McCabe after Comey’s firing last May underscores the president’s continued fixation on the loyalties of people around him and his frustration with autonomous arms of the government — particularly ones involved in the Russia investigation. It’s also emblematic of his early and persistent distrust of top Justice Department officials. The combination of those sentiments whipped the president into such a fury over Comey last year that he wanted his firing to abruptly strip him of any trappings that come with the office and leave him across the country scrambling to find his own way home. McCabe detailed his conversation with Trump after Comey’s firing to several people at the Justice Department, people familiar with the matter said. In 2015 McCabe’s wife, Jill, had run for state office in Virginia. She accepted nearly $500,000 in campaign donations from the super PAC of Terry McAuliffe, a Clinton ally and former governor of Virginia. She lost by just over 2,000 votes. Andrew McCabe was not involved in the FBI’s investigation into Hillary Clinton while his wife was running for office. He became involved in the probe in February 2016. Comey was criticized by many Democrats for his handling of the Clinton inquiry. The Justice Department’s inspector general is investigating. Last month the president also wrote on Twitter: “How can FBI Deputy Director Andrew McCabe, the man in charge, along with leakin’ James Comey, of the Phony Hillary Clinton investigation (including her 33,000 illegally deleted emails) be given $700,000 for wife’s campaign by Clinton Puppets during investigation?” The amount the president said McCabe’s wife received was incorrect. After he fired Comey, Trump met with McCabe in the Oval Office, and, according to The Washington Post, asked McCabe whom he voted for in the 2016 election. McCabe said he did not vote, the Post reported. More recently, when reports surfaced last month that McCabe planned to retire in March after he’s eligible for full benefits, Trump seized on the news. 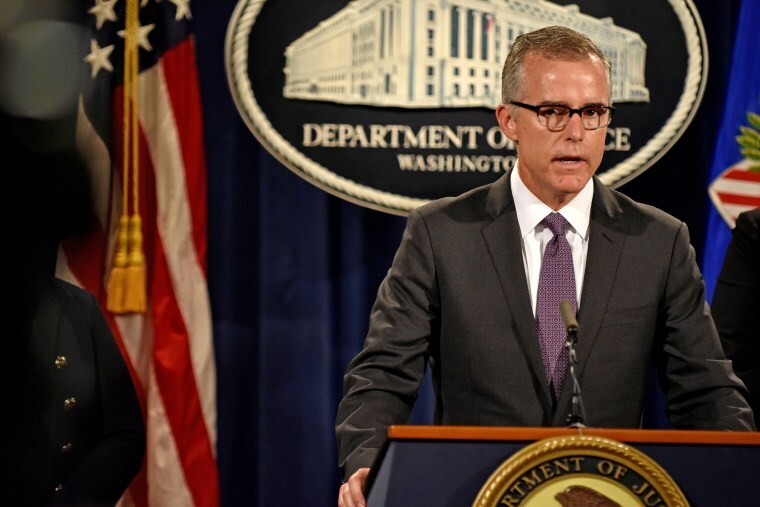 “FBI Deputy Director Andrew McCabe is racing the clock to retire with full benefits. 90 days to go?!! !” the president wrote on Twitter. McCabe’s exit comes in the middle of an investigation by special counsel Robert Mueller into whether the president has tried to obstruct justice in Russia investigation. Given his position at the FBI and his interactions with the president, McCabe is likely to be of use to Mueller in the obstruction inquiry. Mueller was named to oversee the Russia investigation after Comey’s firing, which became a catalyst for the obstruction investigation. The firing sent shock waves across Washington, including within the Trump administration. Comey’s dismissal on May 9, 2017, was hastily executed and even took many senior White House officials by surprise. As it was unfolding, some of them quietly discussed how Comey would get back to Washington, a senior White House official who was there at the time said. “I don’t think anybody had thought about how he’d get home,” the official said. The president’s longtime bodyguard and aide, Keith Schiller, delivered the news of Comey’s firing in envelope he brought to FBI headquarters while Comey was in California. Comey learned of his termination from news reports broadcast on a TV in the room where he was addressing FBI agents in the bureau’s Los Angeles office. He had been in Los Angeles to speak at a recruiting event later that evening. But after learning he was fired, Comey skipped the event. Instead he went to Los Angeles International Airport. Images of Comey on the tarmac boarding the government plane for the flight back to Washington were among the first the public saw of him after he was fired.